Crude prices are down to $48.48 this morning, a loss of $.11 since closing yesterday in the red. 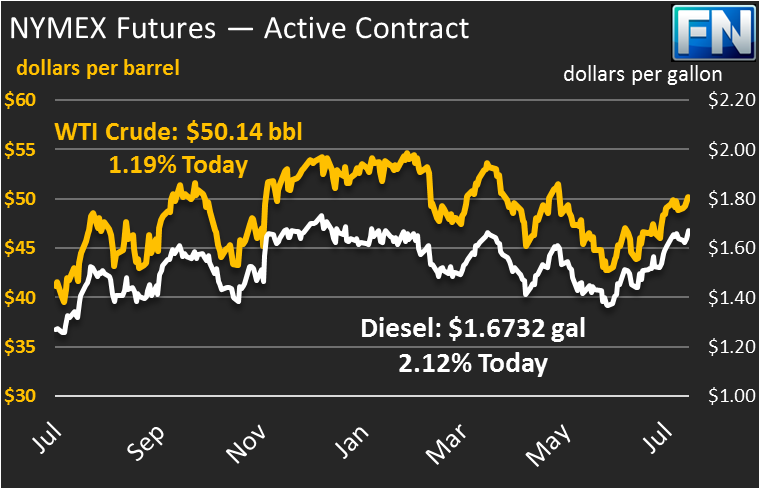 Prices yesterday dropped significantly after surpassing $50/bbl, closing the trading session at $48.59, a loss of roughly 3%. Prices opened this morning at $48.52, more than a dollar below yesterday’s opening price. After a week of trading higher, crude prices appear set to end the week on a low note. Refined products show a similar story. Diesel prices are $1.6290, after losing almost 2.5 cents yesterday (1.5%) and another 23 points this morning. Gasoline prices shed nearly 2 cents yesterday (1.2%), though they’ve gained back 62 points to reach $1.6090. Prices fell sharply yesterday as the International Energy Agency issued another “lower for longer” report, indicating that low oil prices would continue for an extended period. The agency indicated that falling OPEC compliance has hurt efforts by the organization to reduce global supplies and boost prices. Still, the report continued to affirm that the rebalancing is under way. Year-over-year inventories are consistently lower now, for the first time since 2014. Stock markets often fall in response to military threats, and this week has been no exception, with markets posting triple-digit losses. Concerns of an economic slowdown have spilled over to oil markets that are counting heavily on high demand to work through inventories. East Asia is also a major point of global oil consumption, so any disruption there could cause global demand to fall. East Asia is not a major production region, so a conflict is unlikely to disrupt global oil supplies. 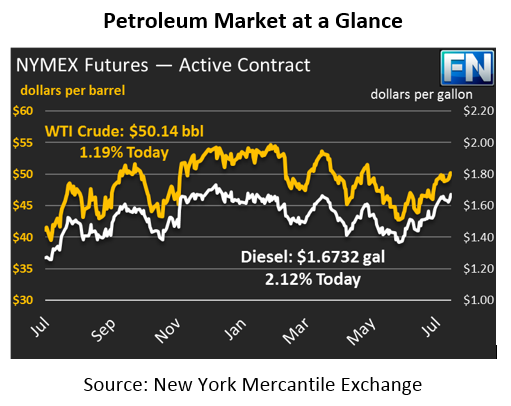 Physical markets are growing tighter, as spreads between different types of crude contracts narrow. Markets are certainly showing signs that OPEC’s cuts are working, but there remains much work to be done by OPEC and their Non-OPEC partners before markets move back to their long-term average levels.